Situated just outside of Townsville, the Alligator Creek Roadhouse is a great place to stop to enjoy views of the nearby Muntalunga Range or stock up before exploring the nearby waterholes and cascades. Musgrave Station is a welcome sight to those travelling up north to Cape York. Situated around halfway between Cohen and the Archer River, this station has camping facilities, fuel and an air strip. The Archer River Roadhouse is located just 66 kilometres north of Coen and is open seven days a week, selling fuel, meals and take-away. Campers are accommodated and dogs are permitted. Positioned on Stockyard Creek, this roadhouse is also relatively close by to Balgal Beach and offers fuel, food and supplies. The Gulf Gate Roadhouse offers basic accommodation, along with a licensed restaurant and fuel station. Positioned right on the border between South Australia and Queensland, Haddon Corner is a must before crossing the state line. This roadhouse and campground is a great stopping point if you want to throw in your line and catch your dinner. Browse the souvenirs and stock up on supplies before you head out. Providing a pleasant break from the road, Bourke and Wills Roadhouse offers a licensed restaurant and plenty of places for camping for the night. The friendly staff will make you feel welcome and the revamped atmosphere is sure to make you want to stay longer. This is the perfect place to stop after a good day's drive from Mt Isa on the way to Tennant Creek. 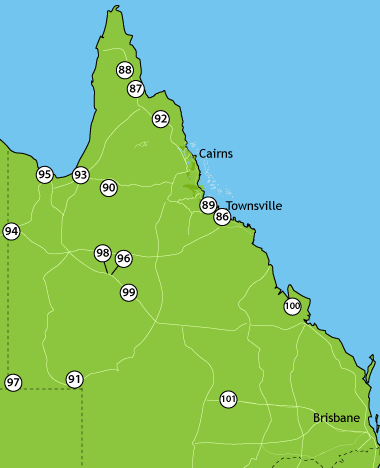 This is also a popular spot for anglers on their way to Booroola and other Gulf Fishing hot spots. Regarded as the frontier in pioneering Queensland, Hells Gate offers shady campgrounds and lawns and is somewhat of an oasis for travellers. Kyuna is regarded as the second home of the Brolgas and is the ideal place to visit to catch a glimpse of these magnificent creatures. Relax with a nice meal, fuel up and enjoy the lively atmosphere. Positioned on one of the nation's best known state corner's (QLD/SA/NT), Poeppel Corner is situated in the Simpson Desert and is only accessible with a 4WD vehicle. Stop in at the roadhouse ad be sure to fuel up because there isn't another one for a while. Although small, the Tirranna Roadhouse offers friendly service and the fuel you will need to continue your journey through Tropical Queensland. Winton is the birthplace of our national song 'Waltzing Matilda', making it a must to stop in at while in this area. It is also the home of Queensland's Boulder Opal. The Marlborough Roadhouse is positioned on what was once known as a 'Horror Stretch', where many mishaps occurred. Today, the roadhouse and its surrounding area don't experience quite so much drama, but it does provide a good stopping point on the road from Rockhampton to Mackay. Open from 6am until 11pm daily, the Morven Roadhouse is sure to take care of your every need while you are travelling in this remote part of the Queensland outback.